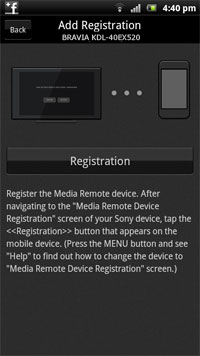 How to register the Media Remote App with Bravia? Register the Media Remote App with Bravia. Connect your TV to the Network (to your wireless router, etc. Please refer to your device or your router's operating instructions). Install Media Remote application on your Android device. For more information how to install Media Remote, please click here . 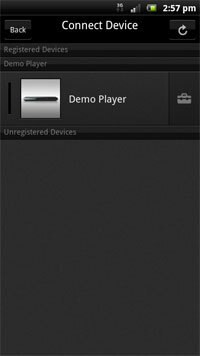 Connect your Android device to the same Network your TV is connected to. On your TV settings, make sure Remote Device/Renderer is set to ON. Note: Menu name or procedure varies depending on the model. Start Media Remote application on your Android device. When you open Media Remote for the first time, you will see Connect Device screen. If your TV and Android device are connected to the same network, your TV will be listed on this screen. If it's not listed on the screen, please tap the refresh button. Tap your TV name to show the Registration button as shown below. Select Start Registration on your TV then tap the Registration button on Media Remote app. After the devices are connected, select OK on Media Remote app and Finish on your TV. Now you can use Media Remote app on your Android device to control your TV. How to register the Media Remote (BD Remote) for Android app with the Blu-ray Disc Player? How to download and install Media Remote app? Where to download the App Remote application? How to register a smartphone or tablet to use with the Video & TV SideView app.